Zhang, Y.; Kartashov, Y.V. 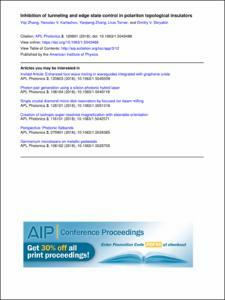 ; Torner, L.; Skryabin, D.
Zhang, Y., Kartashov, Y.V., Zhang, Y., Torner, L., Skryabin, D. Inhibition of tunneling and edge state control in polariton topological insulators. "APL Photonics", 1 Desembre 2018, vol. 3, p. 1-9.